Cauvery Verdict: Cross Examining the Balancing Dictum? HomeSouth IndiaCauvery Verdict: Cross Examining the Balancing Dictum? The Supreme Court of India, on Friday, February 16th, declared its verdict on the Cauvery water dispute which has prolonged for decades. The apex court altered the CWDT’s (Cauvery Water Dispute Tribunal) final award of Cauvery water accorded to the states of Tamil Nadu and Karnataka, by transferring 14.75 tmc ft. (thousand million cubic feet) from Tamil Nadu’s awarded share to Karnataka. On June 2nd, 1990, the Government of India was directed by the honorable Supreme Court of India to constitute the CWDT. The tribunal was set up to hear all disputes regarding the sharing of Cauvery river water and hear to the demands put forth by the states of Karnataka, Tamil Nadu, Kerala and Puducherry. The tribunal delivered its final verdict on February 5th, 2007. In its verdict, the tribunal allocated 419 tmc ft. of water annually to Tamil Nadu and 270 tmc ft. to Karnataka; 30 tmc ft. of Cauvery river water to Kerala and 7 tmc ft. to Puducherry. Karnataka was instructed to release 192 tmc ft. of water to Tamil Nadu in a normal year spanning June to May. Tamil Nadu and Karnataka, unhappy with the decision, filed a revision petition before the tribunal soliciting a review. In July 2014, the CWDT met in New Delhi to hear petitions filed by Tamil Nadu, Karnataka and Kerala seeking clarification on the final award it had passed on February 5, 2007, granting the share of water for each State. 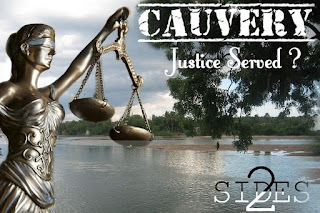 On February 16th, 2018 Supreme Court reduced Tamil Nadu’s share of Cauvery water. The judgement clarified that Karnataka would now have an augmented share of 14.75 tmc ft. water per year while Tamil Nadu would get 404.25 tmc ft., which will be 14.75 tmc ft. less than what was allotted by the CWDT back in 2007. Karnataka’s share of 270 tmc ft. of Cauvery water was increased to 284.75 tmc ft. and the State was instructed to supply 177.25 tmc ft. of Cauvery water to Tamil Nadu from its Biligundlu dam instead of 192 tmc ft. Meanwhile Kerala and Puducherry had no changes in their final awards made by the CWDT in 2007. Conflicts over the sharing of the Cauvery Water, primarily between the states of T.N. and Karnataka, have festered on for decades. The Supreme Court delivered a landmark verdict on Friday, Feb 16th by granting 14.75 tmc ft. more to Karnataka thereby attending to the economic and social needs of the basin state’s populace. The entitlement of 4.75 tmc ft. out of the 14.75 tmc ft. to the global megacity of Bengaluru for their “domestic and drinking purposes” comes as a much-needed comfort. The city has been facing crisis in the form of exhaustion and contamination of its water resources due to globalization and overpopulation and has registered an intensifying call for aid. The verdict from the final court of appeal was embraced by the State and the Chief Minister Siddaramaiah hailed that the injustice meted out to Karnataka has been set right by the S.C’s verdict. The apex court emphasized on the "principle of equality" and the fact that "equal apportionment does not imply an equal division of water" but rather "an equal consideration and equal economic opportunity of the co-basin states”. The Supreme Court stated that an interstate river like Cauvery was “a national asset” and no state could claim exclusive ownership of its waters or deprive other states of their equitable shares. Despite the partial victory as claimed by the legal team representing the State, the farmers of Karnataka have raised concerns over the lack of distress sharing mechanism in the pronouncement and the development of the Cauvery Management Board. The Supreme Court’s verdict on the Cauvery Issue encountered disappointing response from the state of Tamil Nadu with the T.N Deputy Chief Minister O.Panneerselvam asserting that “T.N. has more rights as a lower riparian State over the Cauvery water”. The State government also faced reproval from the Opposition which asserted that the arguments made before the judges were feeble and condemne that the final verdict was a setback to the State’s interests. However the acknowledgement of the appeal for the establishment of the Cauvery Management Board (CMB) was lauded by the State. The establishment of the CMB to oversee the implementation of the Tribunal’s award corrected by the S.C. will take the issue out of the political grip, depriving Karnataka of the power to exercise control over its reservoirs. In other words, Karnataka cannot employ the option to release water to Tamil Nadu only after it had an adequate storage in the reservoirs, specifically during periods of distress. Despite the negative reactions over the reduced quantum of T.N.’s share, this reduction will have a minor effect on T.N. because the share of curtailment is small. The CWDT did not take into account groundwater availability in its final award and the Supreme Court observed that T.N. could “tap at least 10 tmc ft. of groundwater instead of banking on Cauvery water from Karnataka”. The apex court has consequently vested T.N. with the responsibility of protecting its groundwater resources and to perform extraction on a regular basis contrariwise it result in depletion of the resource. In the end, the verdict of the Supreme Court is an exemplar for fair and scientific resolution in water sharing dispute and asserts a basin State’s right to its share of water. It’s a call to both states to shed their narrow minded outlooks and maintain unanimity in the issue by reflecting on the fact that “water is a scarce and precious national asset”.